I'm doing downhill (alpine) skiing on the piste. The slopes I'm on range from blue (easiest) to black (hardest). Are there any training exercises I can do to improve it? Bend knees and hips, keep your poles into your field of view and press down on your downhill ski. When turning you stand up but also push forward. And then press on the new downhill ski. I'm assuming I'm missing a few aspects to this definition. Most others involved holding both your poles. I think it is important between position and turning technique. I am going to focus on the position you want to have while going straight, without actively breaking, accelerating or turning - i.e. a "neutral" or "basic" position. First of all I agree with @Gabriel C. that you should have an active stance. For me this means having body tension, but not being stiff as well as being able to bend and/or straighten your knees when necessary. Second, it is important to have your weight to the front (when skiing on prepared piste). 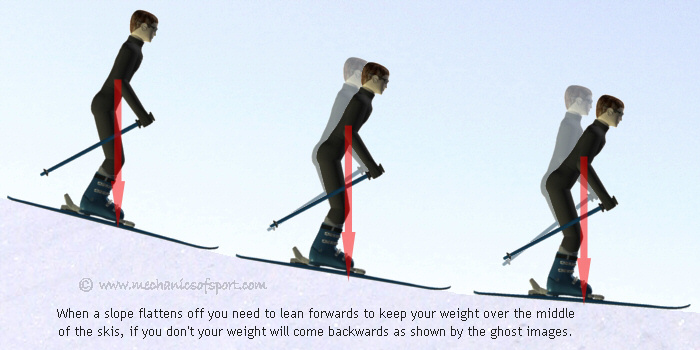 The further your weight is to the front, the more control you have on how your skis behave. You can experience this yourself: try leaning back, and you will see how your skis start to flutter. Lean front, and they will be much more steady. I have seen a lot of beginners that lean to far back, especially when they start to panic. This makes the situation worse, because the skis react worse and worse to their attempts to control them. It might need some confidence to lean forward in a way that would cause you to fall without skis, but just try it out! To achieve the combination of these, it makes sense to bend your knees a little bit (allows you to react to bumps and the like) as well as your hips (allows you to lean forward so you get your weight to the front and control over your skis). It is important not to bend your knees too much though - this would cause your backside to be very low and to the back and can be a difficult position to recover from, depending on the strength of your thighs. Furthermore (assuming you use carving skis), leaning slightly uphill and putting more weight on the uphill borders of your skis will straighten your course and give you more speed. For turning, I would just push my downhill ski slightly forward and change weight to the downhill edge. I am unsure if I have more weight on one of the skis in the "neutral" position, but I think I distribute it quite evenly. From what you describe as being taught, the basic position seems to align with the concept of being relaxed and in an active stance as opposed to being stiff and static. This makes it so you can respond to changes like bumps and ridges more adquately and in turn retain more control than if you were being jolted around and unable to absorb stresses in flexed joints. You know that you've assimilated this when skiing becomes smoother and less stressful. A stance is generally thought of as a set position, but in skiing we are always changing direction and speed and do not stay in the same positions for very long. This means that our stance must constantly change, so it is best explained as a variable position that changes depending on variables like direction, speed and the angle of the slope, with other elements added when necessary. The same concept is present in many sports, a great example being mountain biking where active stance is very similar to downhill skiing. Even cross-country skiing requires such a stance when negociating fast turns and downhills. This doesn't go into the many other aspects of skiing as they are gradually added as skill increases. For more info, check articles on the subject. Be able to absorb bumps through the legs and allow the body to flex. This means that the knees must be bent, as well as all other joints. There should be no joints that are straight as they must all be able to move in both directions. Put the bodies weight in the right position. This comes mainly from the waist leaning the body forwards or sideways. the body leaning slightly forward to put your weight over the middle of the skis (and making it able to flex in both directions), looking forward with your arms out to the sides slightly in front of you with the elbows slightly bent. The upper body also needs to be positioned so that our weight is transferred to the downhill/outside ski, and to the middle of the ski lengthways. ..., and to the downhill side a bit to put our weight over the downhill ski (lateral weight distribution). When traveling across the mountain face you start the turn by extending upwards and leaning forwards moving the hips over the downhill ski. Then you move your weight to both skis, moving the skis inline with your body (facing downhill). Then you put all your weight on the downhill ski bringing it on its edge so that you turn into the fall line. Finally you revert back to the traversing stance by bending your knees and pointing your body back downhill. Which mostly comes down to starting in the 'traversing stance', changing into the 'straight forward stance' and then changing again into the 'traversing stance'. Having bent ankles, knees and hips, so that you absorb bumps. Skis should be hip width apart. Put same weight on both skis. Position body so your centre of gravity is over the middle of the skis. This means you should lean forward when going downhill, and slightly backwards if you're going uphill. Put weight on the down hill ski. Move your upper body so that it is inline with he skis, which means your body will be twisted slightly toward the fall-line. Lean forward to put weight in the middle of the skis. I don't think it is possible to explain how to do this in words. Peilonrayz makes a good crack at it, but even as a skier I get confused by this. It's like trying to tell someone how to tie their shoes. The following applies to any physical skill. "Show me" is far better than "Tell me" Search for downhill skiing tutorial on youtube. Watching a new physical activity really helps. Not just one. Watch a dozen different ones. Some you may want to rewatch. Youtube has an option to play at half or quarter speed. Biggest mistake most people make is leaning back. Imagine a banana in your skiboot between your shin and the front of the boot. Keep your weight forward so that you are squishing the banana. This feels very risky, and seems counterintuitive. Try this right now: Stand up. Bend your knees a bit. Close your eyes. Now can you feel weight on both your heel and toe? Put more weight on your toes. Play with that, moving your weight from toe to heel. Push it to the point where your heel lifts up just a bit. Go back to where your toes lift up a bit. Keep your eyes closed, otherwise you are judging your lean with your eyes. That shift of weight between heel and toe is a big part of controlling the sky. Too many people put weight on their heels. Needs to be more on the toes. In general a shorter ski is easier to work with. If you are having trouble try a ski 20 cm shorter. A shorter ski however is slower. https://www.youtube.com/watch?v=OcLEgI_vtZQ Progression from side slip. Illustrates how weight shifting changes the shape of the ski. https://www.youtube.com/user/elatemedia good set of videos. Scroll down and start from the bottom up. Note: Shift - period speeds a video up, shift - comma slows it down. Voice gets unintelligable below .5 speed. Want to that action again? K backs up 10 seconds. left arrow 5 seconds. Not the answer you're looking for? Browse other questions tagged skiing technique or ask your own question. What exercises should you do before a ski trip to build leg stamina?